Recent years have seen important advances in the technology and techniques available to surgeons performing gynecologic surgery as well as reconstructive of clinical pelvic procedures. These developments took place in a wide variety settings from regional teaching centers to private clinical facilities. 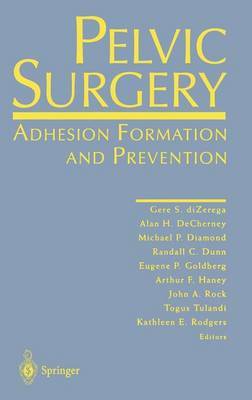 In 1996, the leading investigators from around the world gathered to discuss the present status of pelvic surgery and adhesion prevention with a look toward the future of patient care. This volume contains the proceedings of that meeting: the Third Interna- tional Congress on Pelvic Surgery and Adhesion Prevention. Each chapter in- cludes the material presented at the congress as well as a timely update of the authors' latest research and clinical thinking. Presentation integrating basic and clinical science provide the basis for con- sidering peritoneal repair after surgery including the interaction of growth factors and other biochemical messengers. Research has increased the understanding of mesothelial reepithelialization and has led to new surgical technologies to reduce adhesion fonnation. A state-of-the-art review of emerging surgical adjuvants for adhesion prevention is provided, including discussion of barriers, gels, and poly- mers as well as "designer" drugs effective at modifying the peritoneal response to injury. Assessment of clinical outcome in a wide variety of gynecologic surgical procedures brings into focus the benefits available as a result of these new tech- nologies.